Is your power bank not enough for charging your gadgets? Do you want a better option? With the Ghostek NRGsolar Series 40L, you will have a charging station that you can bring anywhere you go. This product is a 40L solar-powered backpack that can provide enough power for your smartphone, tablet and even your laptop. It has a 16,000mAh battery and an 8.8-watt solar panel on the surface of the backpack where it can collect more sunlight. Aside from this, it also has 5 USB ports so you can charge different devices at once. The ports are found both on the inside and outside of the pack. There is also an LED light to indicate the power status of the solar backpack. Of course, this product is also a functional backpack for carrying your belongings. It has multiple compartments where you can store things. It also has a huge compartment for laptops up to 15.6 inches in size. Lastly, the Ghostek NRGsolar Series 40L is also waterproof, so it can protect your valuables even when it rains. Ghostek is a New York-based manufacturer known for creating phone cases that are rugged yet stylish. Their goal in creating solar backpacks is the same and that is to help people accomplish their tasks by protecting their gadgets. The Ghostek NRGsolar Series 40L can definitely do this. This backpack is engineered be sturdy, strong and capable of providing enough power source to your gadgets. 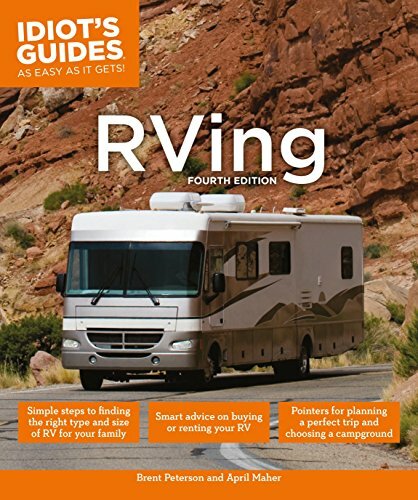 Take a look at some of its features and how they are beneficial for your hiking adventures or everyday needs. If you are looking for a solar backpack that you can bring on treks in the mountains, then this is one of your best options. Why? Because it has plenty of room for all your things, including your sensitive gadgets. You can secure your smartphone, tablet and even a 15-inch laptop. The backpack is made of a water-resistant material and has enough padding to keep your gadgets safe during journeys as they are being recharged. Aside from this, the backpack is also has a sturdy construction so it can hold up as many valuables as you can carry. It is even comfortable and lightweight on the back too. Even if you are staying in the city, this stylish black solar backpack will look great. Some backpacks only allow one or two devices to be charged at the same time, but this isn’t the case with this solar backpack as it has plenty of USB ports for all your devices. 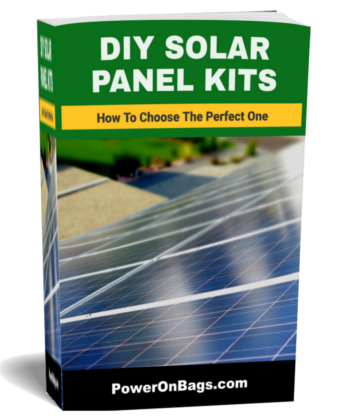 You can connect directly to the solar panel and charge two devices as it collects solar power from the sun. There are two more USB ports inside the backpack and another as an external port. You can leave your devices charging while you take the backpack off. The manufacturer added an LED power indicator so you can check whether the 16,000mAh battery pack has enough power or is plugged into a device. This way, you will know when you have to expose the solar panel to the sun. One of the reasons why you might not go for this brand is the price. It is quite expensive and less affordable than some of the other options on the market. Aside from this, it also falls behind some other solar backpacks in terms of battery specification. For a similar price, you can get a 10-watt 19,800mAh capacity battery or more. 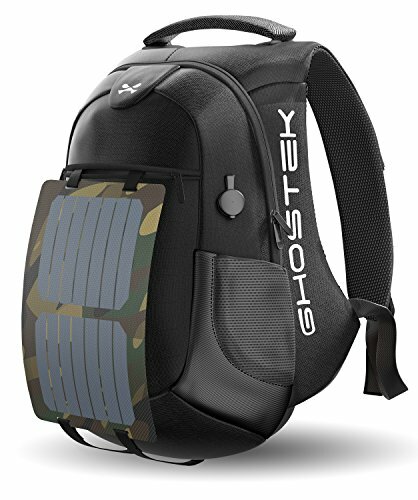 Other than these issues, this solar backpack is good to go. Despite a few drawbacks, the Ghostek NRGsolar Series 40L is still a great pick. In fact, it is generally considered one of the best solar backpacks because of its features that offer great functionality and portability. Not only can you carry your 15-inch laptop, smartphones and other devices, you can also charge them as you walk in the sun. This backpack is strong, sturdy and lightweight, and has a beautiful black design. Whether you are an adventure enthusiast or a college student, this backpack is surely a nice thing to have. Thanks for this wonderful info about this solar backbags, this is exactly what I’m looking for. Would you be able to do a review on pocket size solar USB chargers down the road?